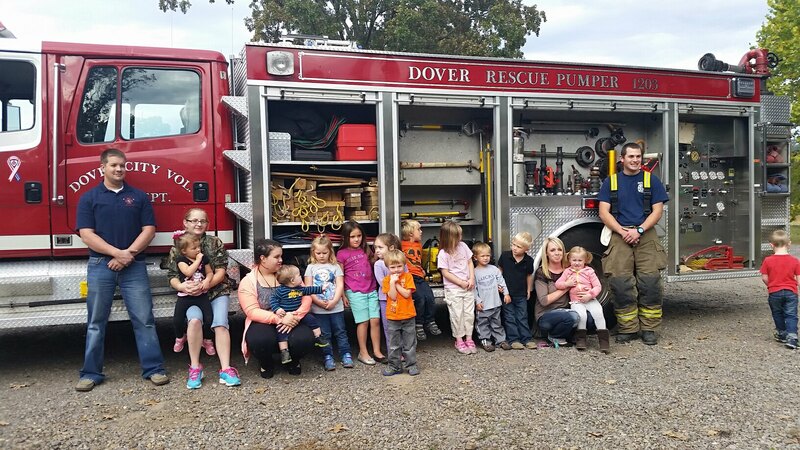 Captain Justin Smith and Firefighter Mac Baker with the Dover City Fire Department spent time with the children of Save the Children Pre-School in Dover, teaching them about fire safety. Parents and children both were present for the education event. Captain Smith and Firefighter Baker taught the Stop, Drop and Roll, Get low and stay low, Get out and stay out plus many other very important safety methods. The children were able to walk around the Engine and see all the tools that are used to fight fire and rescue people with. They also had a chance to see what a firefighter looks and sounds like if one is coming to assist them out of a burning building. Thank you to Save the Children for allowing Captain Smith and Firefighter Baker the chance to speak with them. Captain David Taylor and Captain Cary Teague had the chance to work with kids from Dover Elementary School, teaching them about fire safety. The students learned the Stop, Drop and Roll, Get out and Stay out, and Get low and Stay low methods of fire safety also. Thank you to the teachers and faculty of the Dover Elementary School for allowing them the chance to teach their students a valuble lesson in fire safety.